Cooking Persian food is not easy! There's a lot of prep work involved and a good amount of time is required for the meal itself to cook and the flavors to become harmonious. One of the main challenges in Persian cooking, is turning out the perfect rice. The rice needs to be cooked through, yet have separated grains. I was about 13 when I asked my mom to teach me how to cook, and she thought it best to start with a simple kateh with saffron chicken. Then she moved on to teaching me how to make chelow (the Iranian style of cooking rice, which involves soaking, parboiling, draining, and then steaming the rice). This is the more challenging style in Persian cooking. And finally we moved to polow. 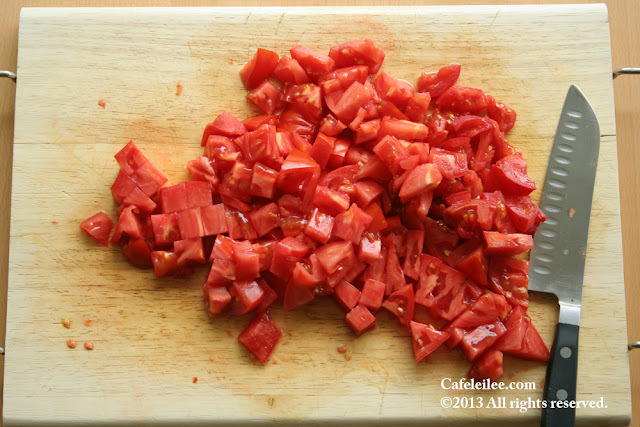 Which is cooked the same way as chelow, with the exception that it is usually mixed with meat, vegetables and fruits. For recipes on some polows you can check here and here. Now, I don't want to scare you off, but the most difficult rice dish to make, for me, was Lubia polow. The challenge is that the sauce you make to mix in with your rice will soak into your rice and might make your rice mushy. And in Persian cooking you don't want your rice to be mushy. The trick is to know when to drain your rice while it's parboiling, and also to let the liquid in your sauce to evaporate enough so it's not so watery. Place the rice in a large bowl and cover with water. Agitate gently with your hand, and then pour off the water. Repeat this 3 to 4 times until the rice is completely clean. Soak the rice with 5 cups of water and 3 teaspoons salt for 2 to 4 hours. 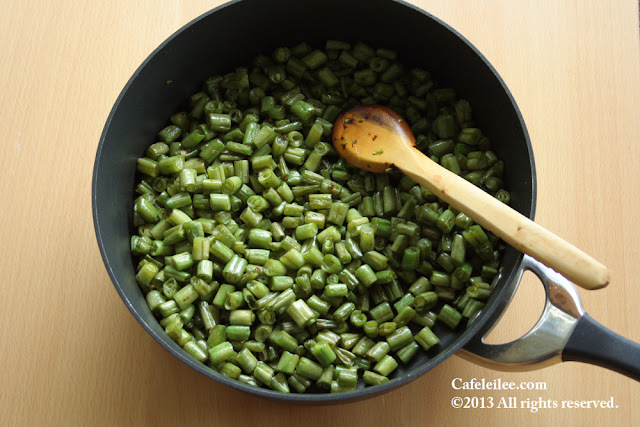 In a large pan over medium heat, heat 2 tablespoons of oil and sauté the green beans for about 10 minutes, until slightly golden. Transfer to a plate. In the same pan, heat 2 tablespoon of oil over medium heat and brown onions. Add meat and brown. Add spices, salt, tomato paste, diced tomatoes, and the sautéed green beans. Reduce heat to medium low, cover and simmer for about 40 minutes. In a large pot, bring 10 cups of water to a boil on high heat. Drain rice and gently pour into the boiling water. Bring water back to boil and boil for 5 to 7 minutes. Test the rice to see if it's done. Rice grains should be just shy of fully cooked, soft on the outside and firm on the inside. Drain rice and rinse with cool water. Clean out the pot and return to the stove, add half of the remaining oil to the pot over medium to high heat. Arrange the potato sliced at the bottom of the pot and sprinkle with salt. When one side has slightly browned turn and remove from heat. With a spatula place 1 spatula of rice in the pot, layer it with meat and green bean sauce, repeat until all the rice and the sauce have been transferred to the pot, building a pyramid while making the layers. Make 2 to 3 holes in the rice to let the steam out. Cook for ten minutes over medium heat. Pour the remaining oil and saffron water over rice, place a dish towel or 3 layers of paper towel over pot and firmly cover the pot with its lid and reduce the heat to medium-low. Cook for another 45 minutes. Using spatula place rice on a serving platter without touching the crust. Mound the rice in shape of a pyramid. Then remove the potato crust and place it on the side or another dish. 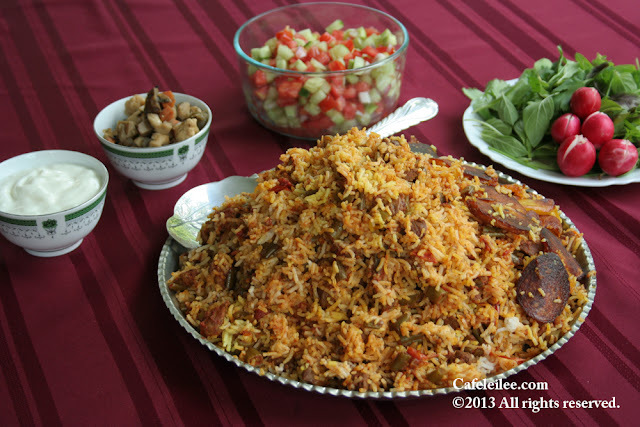 Serve with sabzi khordan. Noosh-e-jaan. خداییش درست کردن غذای ایرانی کار ساده ای نیست. غذای ایرانی کلی مقدمه چینی داره، سبزی پاک کردن و شستن، پیاز داغ درست کردن، و غیره. از اون طرف هم یک وقتی باید بزاریم که غذا جا بیافته. حالا از همه سخت تر هم برای کسی که میخواد تازه آشپزی کردن یاد بگیره درست کردن برنج هست به خصوص به طرز چلویی و پلویی. تابستونی که میخواستم برام اول دبیرستان شروع کردم به آشپزی یاد گرفتن و مثل اکثر دخترهای ایرانی کدبانو آموزش آشپزی رو با درست کردن برنج به من یاد داد. که بعد از خوراندن اهل خانه به انواع برنج شل و دون و شور تا آخر تابستون کم کم درست کردن برنج ساده به روش چلو دستم اومد. حالا بعدش رفتیم سراغ پلو های مختلف، که زیاد سخت نبودن الا این لوبیا پلو، که تصمیم نداشت با ما همکاری کنه و هر کار میکردم شل از آب در میومد و از اونجایی که زیاد هم از لوبیا پلو خوشم نمیومد، این شکست ها من رو دلچرکین تر هم کرد و کلا درست کردن لوبیا پلو رو گذاشتم کنار. تا اینکه بلاخره تا چند سال پیش شروع کردم به مبارزه و بلاخره لمش دستم اومد که همش به این رابط داره که مایه رو کم آب کنیم و برنج رو یک کم زود تر آبکش. برنج را ٣-٤ بار با آب بشوید، بعد با ٥ پیمانه آب و ٣ قاشق مربا خوری نمک بگذارید برای ٢ تا ٤ ساعت خیس بخورد. در یک تابه بزرگ، دو قاشق از روغن را روی حرارت متوسط داغ کنید و لوبیا را برای حدود ١٠ دقیقه تفت دهید تا کامی طلایی شوند.و به یک بشقاب منتقل کنید. در همان تابه دو قاشق دیگر روغن را روی حرارت متوسط گرم کنید و پیاز را سرخ کنید. گوشت را اضافه کنید و تفت دهید تا قهوه ای شود. ادویه ها را با نمک و رب گوجه و گوجه فرنگی خرد شده و لوبیا سبز به تابه اضافه کنید. همه مواد را مخلوط کنید، در تابه را بگذارد، و حرارت را کم کنید و بگذارد تا مایع کم کم جوش بخورد. در یک قابلمه بزرگ ١٠ پیمانه آب را روی حرارت بالا جوش بیاورید. آب برنج را خالی کنید و برنج را به آب جوش اضافه کنید. بگذارد برنج برای ٥ تا ٧ دقیقه جوش بخورد تا قد بکشد، برنج را امتحان کنید و هر وقت فکر میکنید که با یک جوش دیگر برنج کاملا پخته میشود برنج را آبکش کنید. و روی آن یکی دو لیوان آب سرد بریزید. قابلمه را تمیز کنید و به اجاق بر گردانید . نصف باقی روغن را در قابلمه داغ کنید، حرارت را روی متوسط بگذارد و ورقه های سیب زمینی را ته قابلمه بچینید و روی آنها نمک بپاشد. هر وقت یک روی سیب زمینی سرخ شد سیب زمینی ها را برگردانید و از روی حرارت بر دارید. یک کفگیر از برنج را روی سیبزمینی ها بریزید و یک لایه از مایه روی آن بریزید. این کار را ادامه دهید تا همه برنج و مایه به قابلمه منتقل شوند. بگذارد برنج روی حرارت متوسط برای ١٠ دقیقه دم بکشد، سپس شعله را کم کنید و باقی روغن و زعفران آب شده را روی برنج بریزید. دم کنی را روی در قابلمه قرار دهید و بگذارید برنج برای ٤٥ دقیقه دیگر هم دم بکشد. برنج را به دیس مناسب منتقل کنید و ته دیگ را هم در بیاورید و به ظرف دیگری یا کنار برنج منتقل کنید. با سبزی خوردن لوبیا پلو را نوش جان کنید.